Strawberries… lovely strawberries. I grew up making strawberry jam every summer with mom. It’s what taught me how to preserve–and how to avoid getting burned in the kitchen! Every June, we used to pile into the van, load up with sunscreen and be sent out into the fields like little workers. 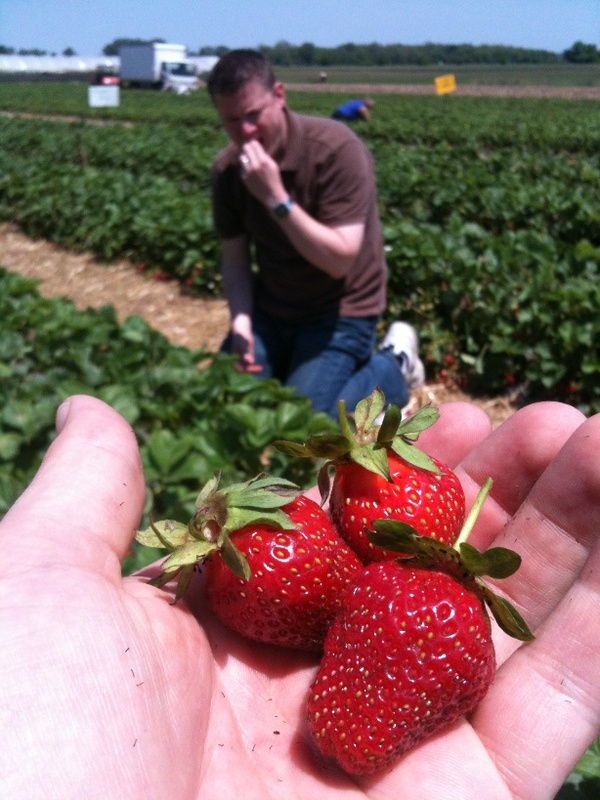 I remember eating a LOT of strawberries, making a huge mess and whining about how many more we had to pick. I guess we both got caught red-handed. 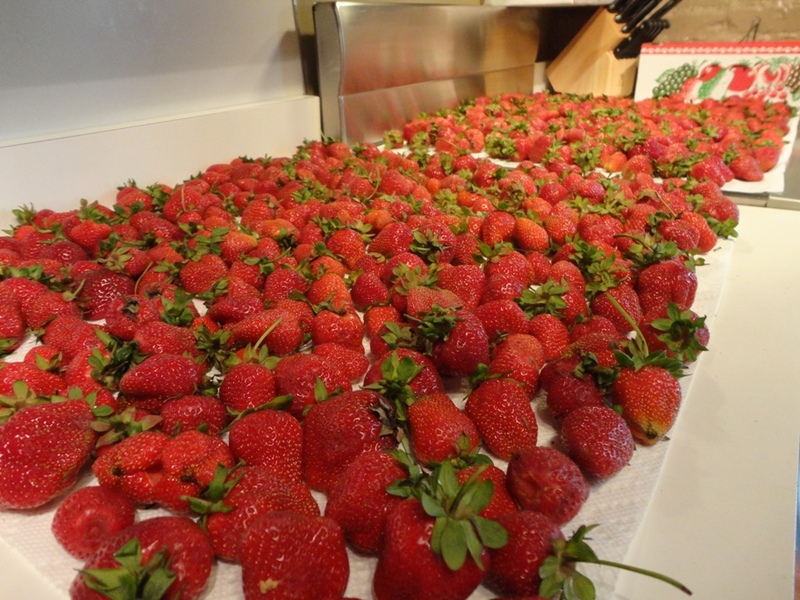 Fresh strawberries (day of or day after picking) are the best to use because they’re the most reliable. As soon as fruit is picked it starts losing water and decaying. 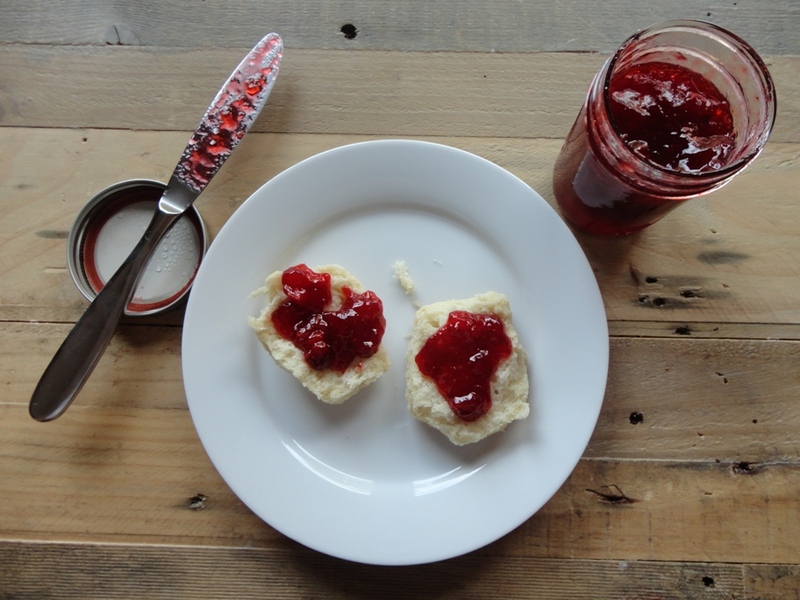 Neither of these processes make for good jam because they alter flavor and moisture content, which can muck up your jam’s texture. Plan for this when you go to pick/buy berries. I won’t give exact measurements on ingredients because different pectin brands can work differently. Therefore, I recommend that you follow the recipe on the pectin when it comes to ingredients. 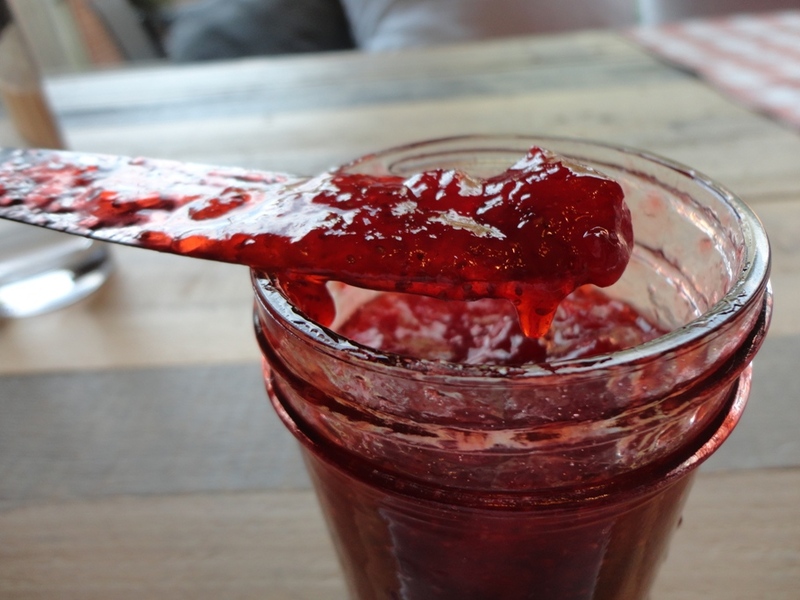 The process of making jam is pretty much the same regardless the brand. 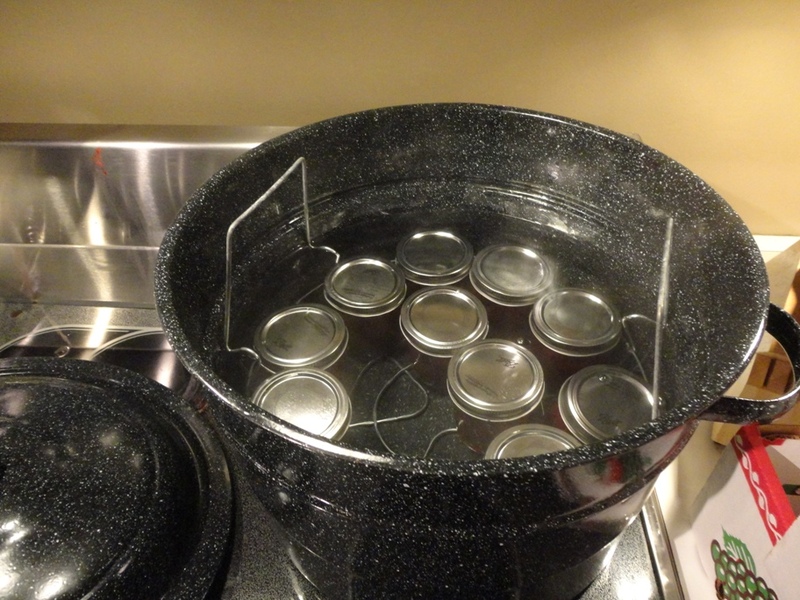 Sterilize jars in boiling water for at least 10 mins, then set them out to receive jam. I usually sterilize my funnel and ladle as well, just not for the full 10 mins. Measure out ALL ingredients into separate containers. Got that all ready? Okay, now you’re ready to start. Trust me, this is a situation where mise en place is crucial. Mash the berries a bit. I don’t get too crazy with this because I like a really chunky jam, but if you want it more smooth, mash a bit more. Don’t use a blender or food processor though or you may end up with a really thin, poorly set jelly. Dump the mashed berries, lemon juice, pectin and salt in a large heavy-bottomed pot & stir together well. Bring to a full, rolling boil while stirring constantly. Be careful though; there’s no saving jam if it gets the least bit burnt. Dump all of the sugar in at once and stir it in. Bring the mixture back to a rolling boil for a full minute–again, while constantly stirring. Be *really* careful–the addition of the sugar will allow the liquid to reach super high temps–over the boiling point. Also, the jars will be super hot from this point on. After a full minute at the boil, remove from the heat and fill each sterilized jar using the funnel and ladle. Wipe the mouth of each jar clean to ensure a good seal with the lid. Using tongs (or a nifty magnet-tipped canning tool) lift the lids and place them on each jar. Carefully place the rings on each jar and tighten just until hand-tight. Don’t over-tighten or the jars could break during processing. Place jars in large pot of simmering water for 10 minutes to allow them to “process”. This kills most pathogens. Into the drink you go, my little captives to boil away! Remove jars at the end of this time and set out to cool. Sit back and enjoy the glorious sound of the lids popping closed. Once the jars have cooled enough to handle, you can tighten the rings again. They usually loosen up a bit while processing. All lined up and ready for labeling. After things cool, pop open one of those puppies and test your jam. Get a cracker, a piece of toast, a biscuit or a spoon and sample your hard work. Enjoy that beautiful taste of late spring/early summer! 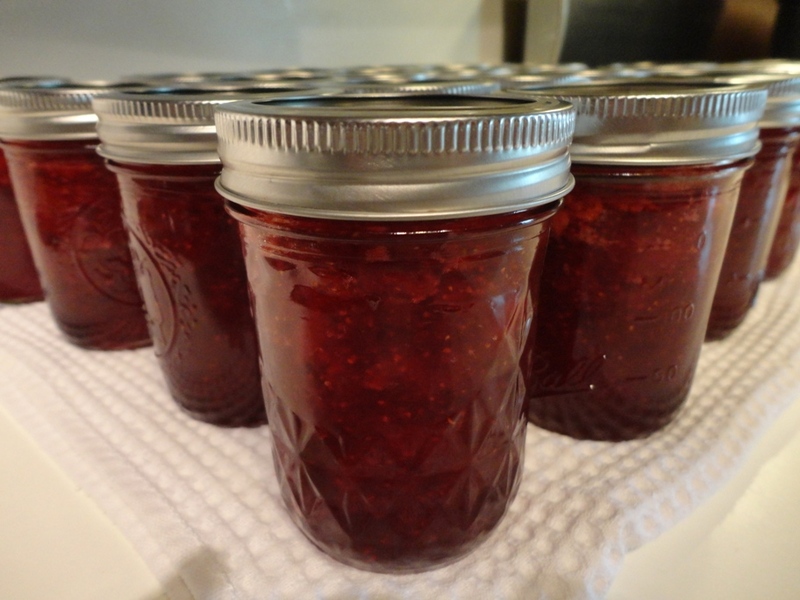 A tad more loose than the typical jam and with lots of chunks, which is just how I prefer it to be. Yeah, 42 jars in total from the 21 lbs! The pictures are amazing and I like the first bullet point under the prep section. Very important!!! It fascinates me that some canners line up jars and fill them all at once (your method) and some fill and cap each jar one at a time (my method). Both work fine but I could never imagine doing it the other way. I think I do it b/c my mind works in factory mode so often. Trying to get better about small batches, less of a “make enough to feed an army” mindset. Hard habit to break.